"Bartenstein" redirects here. For the German principality with a similar name, see Hohenlohe-Bartenstein. 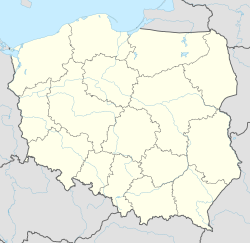 Bartoszyce [bartɔˈʂɨt͡sɛ] ( listen) (German: Bartenstein ( listen); Lithuanian: Barštynas) is a town on the Łyna River in northeastern Poland with 25,621 inhabitants (as of 2005[update]). It is the capital of Bartoszyce County within the Warmian-Masurian Voivodeship. Bartoszyce is on the left shore of river Łyna River in a valley, approximately 90 kilometres (56 miles) east of Elbląg and 55 kilometres (34 miles) south of Kaliningrad, at an altitude of 3 metres (9.8 feet) above sea level. Church built after 1332, and expanded 1360–80 and during the 15th century. Around 1241 the Teutonic Knights constructed a castle on the left shore of the Alle (Łyna) River on the border between the Prussian regions of Natangia and Bartia. The castle was part of the Komturei Balga. It was first composed of block houses, palisades, and earthworks and later built from bricks. Besieged by Old Prussians for four years during a Prussian uprising beginning in 1260, the castle was destroyed in 1264. The Order rebuilt the castle shortly afterwards, but this was besieged by Sudovians in 1273. After uprisings ended, the knights built the Ordensburg out of stone from 1274-80. During the 14th and 15th centuries, the castle was administered by the Komtur of Balga. A settlement developed near the caste on the right shore of the Alle River opposite the castle. First documented in 1326 under the name Rosenthal, it received town privileges from Grand Master Luther von Braunschweig in 1332. After that the name was changed to Bartenstein and the settlement of Rosenthal below the castle on the left shore of the river was relocated, as the left side had become too dangerous from warfare. Komtur Henning Schindekopf of Balga began construction of a wall the town in 1353. The town sided with the Kingdom of Poland and the Prussian Confederation during the Thirteen Years' War (1454–66). The Teutonic castle was destroyed by the town's citizens at the beginning of the war and was not rebuilt afterward. The townsfolk reconciled with the Teutonic Knights in 1460. To stabilize the Order's financial situation, the Order pawned the ruined castle's farmyard and meadows to Wend von Eulenburg in 1469; the entire department of Bartenstein was pawned in 1513 to one of the Heinrich Reuß von Plauen (not the Grand Master) . With the secularization of the Teutonic Order's Prussian territories in 1525, the town became part of the Duchy of Prussia. The town converted to Protestantism in the same year during the Protestant Reformation; it then did not have a Catholic church until the 19th century. Bartenstein became part of the Kingdom of Prussia in 1701 and the Prussian Province of East Prussia in 1773. During the Napoleonic Wars, Prussia and the Russian Empire signed a treaty of alliance in the town on 26 April 1807, the Treaty of Bartenstein. Administrative reform following the wars placed the town within East Prussia's Landkreis Friedland in 1818. The Ełk-Bartoscyze train line ran through the town in 1868, leading to the establishment of industries, including an iron foundry, a machine factory, and a wagon factory. It was also noted for its oak trade. A garrison town for the Prussian Army, Bartenstein was the seat of the district court. Because it had grown to become the largest town in Landkreis Friedland during the 19th century, the town was made the district capital in 1902. Landkreis Friedland was renamed Landkreis Bartenstein in 1927. The foundation of the old castle was used in the construction of the administrative seat; this building was destroyed in 1945. In January 1945 during World War II, the town was 50-60% destroyed during fighting with the Soviet Red Army. After the Potsdam Conference, the town and the area became part of Poland in 1945. The German population was either evacuated or later expelled, and the town was repopulated with Poles and other Slavs. The town, renamed Bartoszyce, was in Olsztyn Voivodeship from 1975-1998. It became part of the Warmian-Masurian Voivodeship in 1999. Note that the above table is based on primary, potentially biased, sources. ^ Der Große Brockhaus, 15th edition, Vol. 2, Leipzig 1929, p. 333. ^ Johann Friedrich Goldbeck: Vollständige Topographie des Königreichs Preußen. Part I: Topographie von Ost-Preussen, Marienwerder 1785, p. 18, no. 1). ^ a b Michael Rademacher: Deutsche Verwaltungsgeschichte Provinz Ostpreußen, Kreis Friedland/Bartenstein (2006). Wikimedia Commons has media related to Bartoszyce. Wikisource has the text of the 1911 Encyclopædia Britannica article Bartenstein. This page was last edited on 15 March 2019, at 08:44 (UTC).